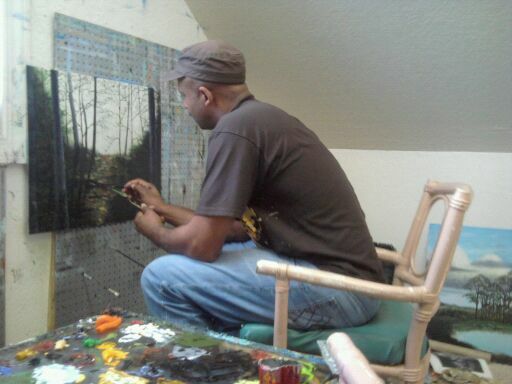 Florida artist Kelvin Hair is this year’s Black History Month featured artist. Kelvin’s work is on view in the 22nd Floor Capitol Gallery in Tallahassee through March 29 as a part of the Division of Cultural Affairs’ Capitol Complex Exhibitions program. Exhibit hours are Monday – Friday, 8:00 am – 5:00 pm. Admission is free. Kelvin Hair grew up surrounded by art. A self-described passionate artist fueled by bold imagination, Kelvin was introduced to art as a toddler and has been creating original works of art since middle school. These days Kelvin is a widely collected Florida artist with a loyal fan base. Kelvin was first introduced to art by his father, famed Highwayman Alfred Hair. The younger Hair started painting on oils at age sixteen. That year A.E. “Beanie” Backus supported Hair by critiquing his artwork and encouraging his painting. Later another Highwayman, Johnny “Hook” Daniels, served as a mentor to Kelvin. “Working with these artists has been a remarkably positive thing. They have told me stories of the days of working with my father, and it gives me a feeling of being with him,” he said. 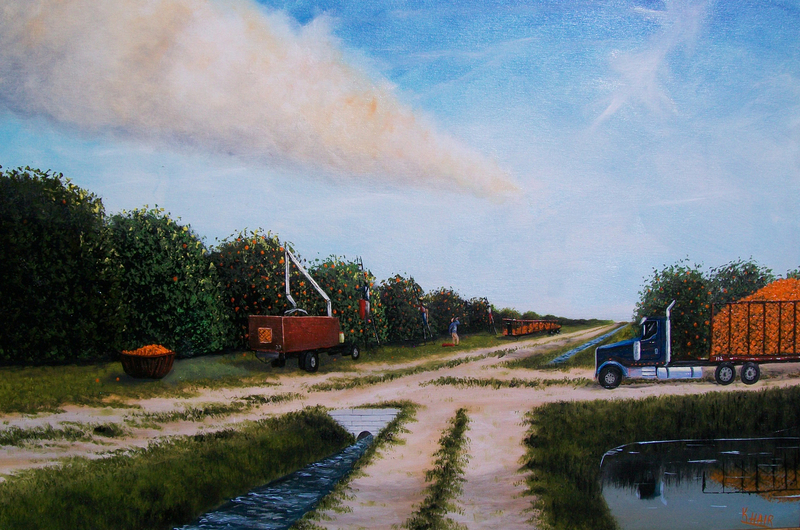 "Harvest Time" oil on canvas by Kelvin Hair on view in the 22nd Floor Capitol Gallery through March 29, 2012. For more information about Kelvin and his artwork, visit www.khairart.com. This entry was posted in Art Talk and tagged Alfred Hair, culture builds florida, Florida, florida division of cultural affairs, Florida Highwaymen, Kelvin Hair, St. Lucie by culturebuildsflorida. Bookmark the permalink. Kelvin – we are so proud of you. Thank you for giving tribute to Johnny Daniels.